1989: Chinese troops crushed protestors in Tianamen Square. 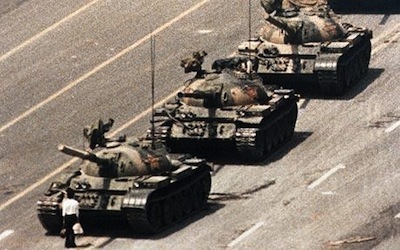 3 June 1989: Chinese troops crushed protestors in Tiananmen Square. The Tiananmen Square protests of 1989, commonly known as the June Fourth Incident (六四事件) or '89 Democracy Movement. (八九民运) in Chinese, were student-led popular demonstrations in Beijing which took place in the spring of 1989 and received broad support from city residents, exposing deep splits within China's political leadership. The protests were forcibly suppressed by hardline leaders who ordered the military to enforce martial law in the country's capital. The crackdown that initiated on June 3–4 became known as the Tiananmen Square Massacre or the June 4 Massacre as troops with assault rifles and tanks inflicted casualties on unarmed civilians trying to block the military's advance towards Tiananmen Square in the heart of Beijing, which student and other demonstrators had occupied for seven weeks. The protests were triggered in April 1989 by the death of former Communist Party General Secretary, Hu Yaobang, a liberal reformer, who was deposed after losing a power struggle with hardliners over the direction of political and economic reforms. University students marched and gathered in Tiananmen Square to mourn. Hu had also voiced grievances against inflation, limited career prospects, and corruption of the party elite. The protesters called for government accountability, freedom of the press, freedom of speech, and the restoration of workers' control over industry. At the height of the protests, about a million people assembled in the Square. Most of them were university students in Beijing.